I’d like to thank Chairman Yoho and Ranking Member Sherman for their invitation to testify, and all Members of the Committee. It is a pleasure to appear before you today to discuss these important issues. My name is Dr. Robert E. Scott and I am a Senior Economist with the Economic Policy Institute, where I am also the Director of Trade and Manufacturing Policy Research. The Economic Policy Institute (EPI) is a non-profit, non-partisan think tank based in Washington D.C. that studies the economy and government policies, and particularly analyzes the impact on low- and middle-income workers in America. Rapid growth of the U.S. trade deficit with China after that country’s entry into the WTO eliminated 3.4 million U.S. jobs between 2001 and 2015 alone. Nearly three-fourths (74.3 percent) of the jobs lost were in manufacturing (2.6 million). The hardest hit states were Oregon, California, New Hampshire, Minnesota and North Carolina. The trade deficit in the computer and electronic parts industry grew the most, and 1,238,300 jobs were lost or displaced, 36.0 percent of the 2001–2015 total. Global trade in advanced technology products—often discussed as a source of comparative advantage for the United States—is instead dominated by China.In 2015, the United States had a $120.7 billion deficit in advanced technology products with China, and this deficit was responsible for 32.9 percent of the total U.S.–China goods trade deficit. In contrast, the United States had a $28.9 billion surplus in advanced technology products with the rest of the world in 2015. Job losses are just the tip of the iceberg when it comes to the negative impacts of US trade with China. Wage losses have hurt not just manufacturing workers but all workers who don’t have a college degree. Between 2001 and 2011 alone, growing trade deficits reduced the incomes of directly impacted workers by $37 billion per year, and growing competition with imports from China and other low wage countries reduced the wages of all non–college graduates by $180 billion per year. There are reasons for China’s large and growing trade surpluses with the United States and the world that go far beyond the free market. China both subsidizes and dumps massive quantities of exports. Specifically it blocks imports, pirates software and technology from foreign producers, invests in massive amounts of excess production capacity in a range of basic industries, often through state owned enterprises (SOEs) (investments that lead to dumping), and operates as a refuse lot for carbon and other industrial pollutants. China has also engaged in extensive and sustained currency manipulation over the past two decades, resulting in persistent currency misalignments. Congress and the President enhance enforcement of all fair trade laws and treaty obligations (through anti-dumping, countervailing duty, and WTO case filings) and implement better early warning systems and mechanisms for responding to import surges. The United States should also make Chinese excess production capacity a priority to address in bilateral negotiations as it is this excess capacity that fuels dumping of exports in the United States. In particular, overcapacity should be addressed by reforming state-owned enterprises, barring China from all U.S. government procurement contracts, and prohibiting SOEs and most Chinese companies from foreign direct investment in U.S. manufacturing or high tech companies, including through enhanced Committee on Foreign Investment in the U.S. (CFIUS) review processes. The United States should also consider imposing a border-adjustable carbon fee on imports produced by energy-intensive industries. In addition, the United States should continue to treat China as a nonmarket economy in fair trade enforcement, because decades of subsidies and market distortions render Chinese market prices meaningless, and because granting China market-economy status would curb the ability to impose tariffs on dumped goods and thus allow Chinese companies to undercut domestic production by flooding WTO nation markets with cheap goods. China should not be rewarded for its market distortions with a bilateral investment treaty. I appreciate Ranking Member Sherman’s past proposals to revoke Most Favored Nation status for China, and to refocus on a trading relationship designed to eliminate the trade imbalance. Lastly, the United States must maintain currency vigilance and consider negotiating a new Plaza Accord to rebalance currencies and global trade. China’s high-tech and industrial policies pose grave threats to the future of U.S. technological leadership, economic growth, and national security. According to the President’s Council of Advisors on Science and Technology (PCAST), China is now exerting a “concerted push … to reshape the semiconductor market in its favor, using industrial policies backed by over one hundred billion dollars in government-directed funds, [which] threatens the competitiveness of U.S. industry.” At the same time, China is advancing a “made in China 2025” plan to accelerate technological innovation and domestic content in 10 broad industries which will be supported by plans to invest $300 billion for low-interest loans, assistance in buying competitors and research subsidies. Overall, the U.S. has fallen behind China in total, late-stage development research, according to a recent report from the Boston Consulting Group. By 2018, China could spend up to twice as much as the U.S. on development research, threatening U.S. leadership in a wide array of manufacturing industries. Growing foreign investment in U.S. manufacturing firms, especially by Chinese multinationals, threatens U.S. national security, control of sensitive financial data and control of key technologies, and is likely to lead to increases in U.S. imports and the trade deficit because foreign multinationals have been responsible for growing U.S. trade deficits, and at least forty percent of the total U.S. trade deficit in every year since 2007. Foreign investments by Chinese firms, often state-owned, such as Zhongwang’s proposed purchase of Aleris Aluminum have been challenged out of concern over the loss of sensitive research data used to make key defense materials such as high-strength alloys and light armor material. Likewise, the Chongqing Casin Enterprise Group, a Chinese firm with possible ties to the Chinese government is preparing to purchase the Chicago Stock Exchange. This purchases poses potential threats to both National Security and to individual firms listed on the Chicago Exchange which are required to share sensitive data in order to be listed on the exchange, information which could be compromised by this foreign investor. Finally, more than fifty members of Congress recently signed a letter to the Treasury Secretary requesting that he initiate a CFIUS review of the purchase of Vertex Railcar Corporation by China Railroad Rolling Stock Corporation (CRRC) and Majestic Legend holdings. CRRC is government owned and subsidized, and the Chinese government could use this purchase to compete unfairly in the US market. CRRC has used subsidized financing to underbid domestic firms on railcar contracts in Boston and Chicago. American suppliers of products such as steel for railcars must now compete against the resources of the Chinese government. These cases illustrate why enhanced CFIUS review is critical for limiting the negative impacts of FDI by Chinese firms in the United States. Thank you again for the opportunity to testify before you today. I look forward to your questions. From 2001 to 2015, imports from China increased dramatically, rising from $102.3 billion in 2001 to $483.2 billion in 2015, as shown in Table 1. U.S. exports to China rose at a rapid rate from 2001 to 2015, but from a much smaller base, from $19.2 billion in 2001 to $116.1 billion in 2015. As a result, China’s exports to the United States in 2015 were more than four times greater than U.S. exports to China. 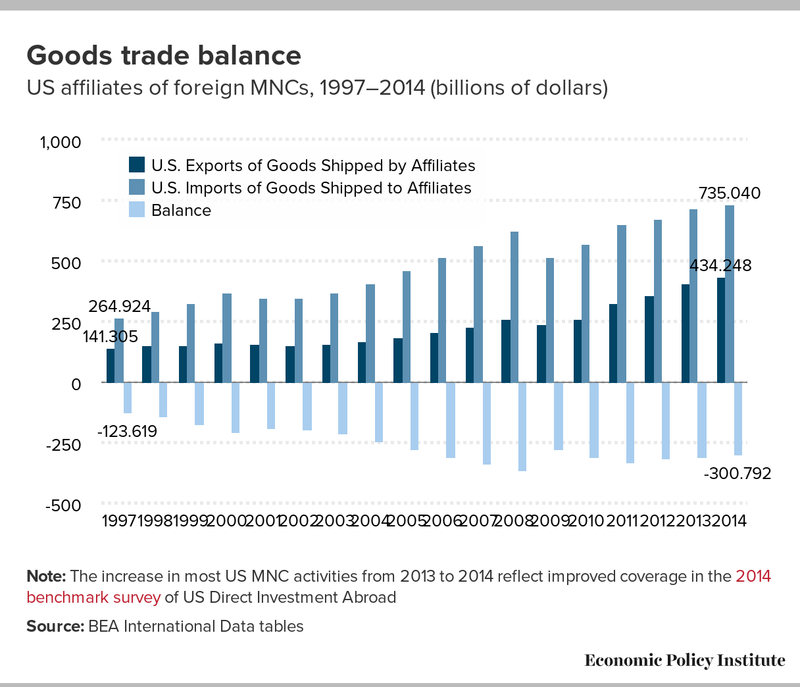 These trade figures make the China trade relationship the United States’ most imbalanced trade relationship by far. * Total exports as reported by the U.S. International Trade Commission include re-exports. Domestic exports are goods produced in the United States and exclude goods produced in other countries and shipped through the United States (known as foreign exports or re-exports). Domestic exports were estimated to be $107.7 billion in 2015. The employment estimates shown here are based on total exports. See footnote 3 for additional details. Source: Author's analysis of U.S. Census Bureau (2013), U.S. International Trade Commission (USITC 2016a), Bureau of Labor Statistics (BLS 2016e), and BLS Employment Projections program (BLS-EP 2014a and 2014b). For a more detailed explanation of data sources and computations, see the appendix. Overall, the U.S. goods trade deficit with China rose from $83.0 billion in 2001 to $367.2 billion in 2015, an increase of $284.1 billion. Put another way, since China entered the WTO in 2001, the U.S. trade deficit with China has increased annually by $20.3 billion, or 11.2 percent, on average. Each $1 billion in exports to another country from the United States supports some American jobs. However, each $1 billion in imports from another country leads to job loss—by destroying existing jobs and preventing new job creation—as imports displace goods that otherwise would have been made in the United States by domestic workers. The net employment effect of trade depends on the changes in the trade balance. An improving trade balance can support job creation, but a growing trade deficit usually results in growing net U.S. job displacement. My report describes the net effect of the trade on employment as jobs “lost or displaced,” with the terms “lost” and “displaced” used interchangeably. The employment impacts of the growing U.S. trade deficit with China are estimated in this paper using an input-output model that estimates the direct and indirect labor requirements of producing output in a given domestic industry. The model includes 195 U.S. industries, 77 of which are in the manufacturing sector (see paper and it’s appendix for further information on data sources and models used). The model estimates the amount of labor (number of jobs) required to produce a given volume of exports and the labor displaced when a given volume of imports is substituted for domestic output. The difference between these two numbers is essentially the jobs displaced by the growing trade deficit, holding all else equal. 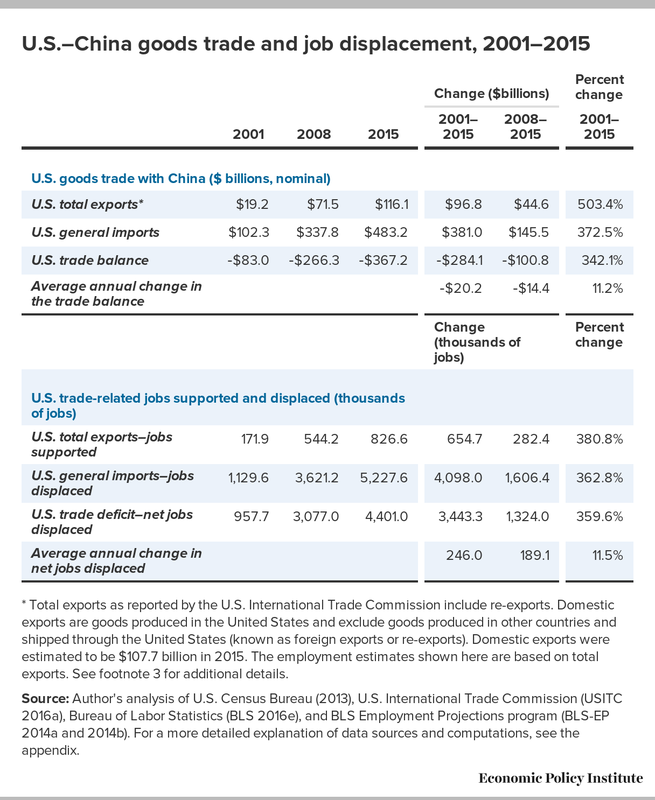 As shown in the bottom half of Table 1, U.S. exports to China in 2001 supported 171,900 jobs, but U.S. imports displaced production that would have supported 1,129,600 jobs. Therefore, the $83.0 billion trade deficit in 2001 displaced 957,700 jobs in that year. Net job displacement rose to 3,077,000 jobs in 2008 and 4,401,000 jobs in 2015. That means that since China’s entry into the WTO in 2001 and through 2015, the increase in the U.S.–China trade deficit eliminated or displaced 3,443,300 U.S. jobs. Also shown in Table 1, the U.S. trade deficit with China increased by $100.8 billion (or 37.9 percent) between 2008 and 2015. During that period, the number of jobs displaced increased by 43.0 percent. Total jobs lost or displaced between 2008 and 2015 alone amounted to 1,324,000, either by the elimination of existing jobs or by the prevention of new job creation through the displacement of domestic production by imports. 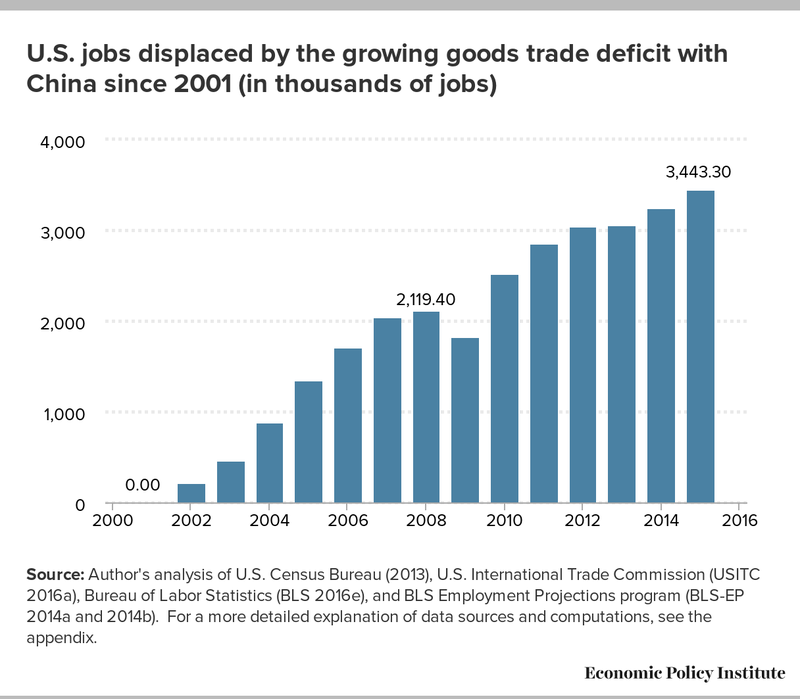 Figure A shows visually how rising trade deficits have displaced a growing number of jobs every year since China joined the WTO, with the exception of 2009 (during the Great Recession). On average, 246,000 jobs per year have been lost or displaced since China’s entry into the WTO (as shown in Table 1, last row, and data column four). The composition of imports from China is changing in fundamental ways, with significant, negative implications for certain kinds of high-skill, high-wage jobs once thought to be the hallmark of the U.S. economy. China is moving rapidly “upscale,” from low-tech, low-skilled, labor-intensive industries such as apparel, footwear, and basic electronics to more capital- and skills-intensive industries such as computers, electrical machinery, and motor vehicle parts. It has developed a rapidly growing trade surplus in these specific industries and in high-technology products in general. The import data (shown in my report, but not reproduced here) reflect China’s rapid expansion into higher-value-added commodities once considered strengths of the United States, such as computer and electronic parts, which accounted for 36.5 percent ($176.6 billion) of U.S. imports from China in 2015. This growth is apparent in the shifting trade balance in advanced technology products (ATP), a broad category of high-end technology goods trade tracked by the U.S. Census Bureau. ATP includes the more advanced elements of the computer and electronic parts industry as well as other sectors such as biotechnology, life sciences, aerospace, nuclear technology, and flexible manufacturing. The ATP sector includes some auto parts; China is one of the top suppliers of auto parts to the United States, having surpassed Germany. In 2015, the United States had a $120.7 billion trade deficit with China in ATP, reflecting a tenfold increase from $11.8 billion in 2002. This ATP deficit was responsible for 32.9 percent of the total U.S.–China trade deficit in 2015. It dwarfs the $28.9 billion surplus in ATP that the United States had with the rest of the world in 2015. As a result of the U.S. ATP deficit with China, the United States ran an overall deficit in ATP products in 2015 (of $91.8 billion), as it has in every year since 2002. Job loss or displacement by industry is directly related to trade flows by industry, as shown in Table 2. The growing trade deficit with China eliminated 2,557,100 manufacturing jobs between 2001 and 2015, nearly three-fourths (74.3 percent) of the total. By far the largest job displacements occurred in the computer and electronic parts industry, which lost 1,238,300 jobs (36.0 percent of the 3.4 million jobs displaced overall). This industry includes computer and peripheral equipment (670,800 jobs, or 19.5 percent of the overall jobs displaced), semiconductors and components (282,500 jobs, or 8.2 percent), and communications, audio, and video equipment (267,000 jobs, or 7.8 percent). Other hard-hit industries included apparel (204,900 jobs displaced, equal to 6.0 percent of the total), fabricated metal products (161,800, or 4.7 percent), textile mills and textile product mills (117,800, or 3.4 percent), miscellaneous manufactured commodities (127,000, or 3.7 percent), furniture and related products (115,900, or 3.4 percent), plastics and rubber products (78,800, or 2.3 percent), and motor vehicles and motor vehicle parts (49,600, or 1.4 percent). Several service industries, which provide key inputs to traded-goods production, experienced significant job displacement, including administrative and support and waste management and remediation services (211,500 jobs, or 6.1 percent) and professional, scientific, and technical services (183,000 jobs, or 5.3 percent). *Subcategory and overall totals may vary slightly due to rounding. Job losses are just the tip of the iceberg when it comes to the negative impacts of US trade with China. Wage losses have hurt not just manufacturing workers but all workers who don’t have a college degree.2 Globalization and unfair trade deals have lowered the wages of U.S. workers by displacing jobs and weakening the bargaining position of low- and middle-wage workers in two main ways. First, increased U.S. trade deficits push jobs out of better-paid tradeable sectors. Jobs displaced by growing trade deficits result in lost wages as workers who leave high-paying import-competing industries such as computer and electronic parts manufacturing take jobs in lower-paying non-tradable industries. Even when jobs in importing industries are replaced in part by jobs in exporting industries such as agriculture or food products, the result is wage losses from rising trade deficits. Second, even if trade deficits do not rise, increased trade changes the composition of jobs, and the new patterns of employment lead to reduced demand for labor and downward pressure on wages. As the United States increases production (and increases exports) of capital-intensive goods and reduces production (and increases imports) of labor-intensive goods, this leads directly to a reduced demand for labor, even if exports and imports measured in dollars balance. Further, as imports displace workers from tradeable sectors (such as manufacturing), these laid-off workers need to accept lower wages to obtain work in other sectors (such as landscaping or construction), and this competition helps to lower the wages of similar workers already employed in these sectors. In short, while it is impossible to replace a waitress (a job in the non-tradable restaurant sector) with imports, her wages are harmed by having to compete with apparel workers who have lost jobs due to increased trade flows. Standard trade models indicate that expanded trade has reduced the annual wages of a full-time American worker without a four-year college degree who earns the median wage by $1,800 per year.3 Given that there are roughly 100 million non-college-educated workers in the U.S. economy, the scale of wage losses suffered by this group likely translates into close to a full 1 percent of GDP—roughly $180 billion. The job and wage losses from the growing U.S. trade deficit with China—and the national security vulnerabilities—should be unacceptable to U.S. policymakers. Especially since this is a solvable problem: The increase in the U.S.–China trade deficit is caused by specific Chinese policies that U.S. policy can address. Extensive government subsidies and the rapid growth of state-owned enterprises have generated a massive buildup of excess capacity in a range of Chinese industries. Excess capacity means that China’s factories are churning out quantities of basic commodity products such as steel products, aluminum, machinery, rubber and plastics and stone, cement, glass, and solar panels that far exceed the demand for these products in China’s domestic economy. To prop up these overcapacity industries, these products are sold in other markets at below market rates (dumping). The United States bears a uniquely large burden, suffering more than other countries from subsidized and dumped imports in these industries. Rather than restructuring the state sector to reduce corporate debt and increase efficiency, the Chinese government continues to prop up nonviable companies with government subsidies, discounted production inputs, and favorable lending from state banks. As a result, the SOEs remain the driving force behind key sectors of the Chinese economy despite incurring significant losses. Under President Xi, the Chinese government has not only expanded its control over SOEs, but also exerted its influence over private companies. By enhancing government oversight … Beijing is able to direct both private and public firms to promote state goals. The proliferation of subsidies (along with currency manipulation, discussed in the next section) has for most of the past 15 years acted like a subsidy to all of China’s exports and a tax on everything that China imports. These subsidies have contributed to the tremendous growth of excess capacity in steel and other primary product industries in that country. Indeed, China has been found guilty of dumping in 759 cases (covering all products) between 1995 and 2014. China’s actions to prop up its steel industry serve as an example. China’s steel production capacity increased tenfold from 2000, when it had roughly the same capacity as the United States, to 2014, when its production capacity reached 1.2 billion tons, while U.S. capacity remained largely unchanged at roughly 100 million tons. China went from being a net steel importer to a net exporter of over 100 million tons of dumped and subsidized steel, worldwide, in 2015. U.S. steel producers absorbed net losses of $1.43 billion in the fourth quarter of 2015 and $233 million in the first quarter of 2016. Domestic steel producers were forced to “reduce capital expenditures” and “shutter capacity and lay off employees,” with nearly 19,000 U.S. steel and iron ore miners facing layoffs “as a result of Chinese overcapacity. China has become one of the world’s biggest polluters and much of this is due to increased emissions from steel and other industries. China operates as a dumping ground for carbon and other key air, water, and waste pollutants. China now produces more sulfur dioxide and carbon dioxide than any other country in the world. For example, China’s steel industry now accounts for 50 percent of the world’s production of carbon dioxide from steelmaking. China extensively suppresses labor rights, which lowers production costs within China. A 2006 AFL-CIO study estimated that repression of labor rights by the Chinese government had lowered manufacturing wages of Chinese workers by between 47 percent and 85 percent. Indirectly, China’s broad network of subsidies and policy supports for favored companies and industries (discussed above) acts as substantial barriers to import penetration, putting international firms that wish to export to China at a substantial disadvantage. For one, China imposes forced technology transfer on foreign firms wishing to invest in China and it engages in cyber-enabled theft of intellectual property. Thus foreign firms are reluctant to do business in China for fear of endangering technology that is critical to their patents’ proprietary technologies and sources of competitive edge in global markets. China also blocks or discourages imports via import substitution policies. These policies impose tariffs, quotas and other direct restrictions on imports, and explicitly favor Chinese domestic producers of commodities that would otherwise be imported, reducing demand for U.S. exports. China is also become less welcoming to foreign investors, and imposes many restrictions on their activities. Its anti-competitive laws prohibit foreign participation in broad sectors of the domestic economy and give preferences to domestic, Chinese companies. China has made it clear that it does not allow foreign competition to occur, via imports or foreign direct investment, in what it views as key sectors of its economy. Proponents of trade deals such as the agreement to endorse China’s admission to the World Trade Organization usually focus on the impacts of these deals on tariff and nontariff barriers to trade. China agreed to make major tariff reductions as a condition of entry into the WTO. President Clinton and many others argued that since U.S. tariff barriers were already low, the agreement would do more to increase U.S. exports to China than to increase U.S. imports from China. Foreign direct investment is an investment by a company or individual in one country that is made in business interests in another country. It can take the form of establishing business operations or acquiring business assets in the other country, such as ownership or controlling interest in a foreign company. Unlike portfolio investments, in which an investor merely purchases equities of foreign-based companies, foreign direct investment establishes effective control of, or at least substantial influence over, the decision making of a foreign business. FDI has played a key role in the growth of China’s manufacturing sector. China is the largest recipient of FDI of all developing countries and is the third-largest recipient of FDI over the past three decades, trailing only the United States and the United Kingdom. For many years, foreign-invested enterprises (both joint ventures and wholly owned subsidiaries) were responsible for roughly two-thirds of China’s global trade surplus. However, due to China’s indigenous innovation policies and other measures that have pushed out foreign investors, often through forced takeovers and illegal theft of intellectual property, this share has fallen sharply to only one-third in 2015. Nonetheless, outsourcing by U.S. entities—through foreign direct investment in factories that make goods for export to the United States—has played a key role in the shift of manufacturing production and jobs from the United States to China since China entered the WTO in 2001. Finally, misalignment of the U.S. dollar and the legacy of currency manipulation by China (and other countries) are major causes of the U.S. trade deficit and of manufacturing job loss. While some countries are still manipulating, as traditionally defined, China is not, and yet we are left with this massive overhang of a trade deficit. The Chinese yuan and other currencies of current and former manipulators are still substantially misaligned, and this hangover is a big cause of U.S. and global trade imbalances. Recent EPI reports have explained how currency manipulation by China and other East Asian nations has led to rising trade surpluses by currency manipulators and thus global trade imbalances, hitting the United States particularly hard. To adequately respond to these threats, Congress and the president should enhance enforcement of all fair trade laws and treaty obligations (through anti-dumping, countervailing duty, and WTO case filings) and implement better early warning systems and mechanisms for responding to import surges. The United States should also make Chinese excess production capacity a priority to address in bilateral negotiations as it is this excess capacity that fuels dumping of exports in the United States. In particular, overcapacity should be addressed by reforming state-owned enterprises, barring China from all U.S. government procurement contracts, and prohibiting SOEs and most Chinese companies from foreign direct investment in U.S. manufacturing or high tech companies, including through enhanced Committee on Foreign Investment in the United States (CFIUS) review processes.4 The United States should also consider imposing a border-adjustable carbon fee on imports produced by energy-intensive industries. In addition, the United States should continue to treat China as a nonmarket economy in fair trade enforcement, because decades of subsidies and market distortions render Chinese market prices meaningless, and because granting China market-economy status would curb the ability to impose tariffs on dumped goods and thus allow Chinese companies to undercut domestic production by flooding WTO nation markets with cheap goods. Also, China should not be rewarded for its market distortions with a bilateral investment treaty. Lastly, the United States must maintain currency vigilance and consider negotiating a new Plaza Accord to rebalance currencies and global trade. Growing foreign investment in U.S. manufacturing firms, especially by Chinese multinationals, threatens U.S. national security, control of sensitive financial data and control of key technologies, and is likely to lead to increases in U.S. imports and the trade deficit. Foreign multinationals have been responsible for growing U.S. trade deficits, as shown in Figure B, and at least forty percent of the total U.S. trade deficit in every year since 2007 (author’s estimates). Foreign investments by Chinese firms, often state-owned, such as Zhongwang’s proposed purchase of Aleris Aluminum have been challenged out of concern over the loss of sensitive research data used to make key defense materials such as high-strength alloys and light armor material.10 Likewise, the Chongqing Casin Enterprise Group, a Chinese firm with possible ties to the Chinese government is preparing to purchase the Chicago Stock Exchange.11 This purchases poses potential threats to both National Security and to individual firms listed on the Chicago Exchange which are required to share sensitive data in order to be listed on the exchange, information which could be compromised by this foreign investor. Finally, more than fifty members of Congress recently signed a letter to the Treasury Secretary requesting that he initiate a CFIUS review of the purchase of Vertex Railcar Corporation by China Railroad Rolling Stock Corporation (CRRC) and Majestic Legend holdings.12 CRRC is government owned and subsidized, and the Chinese government could use this purchase to compete unfairly in the US market. CRRC has used subsidized financing to underbid domestic firms on railcar contracts in Boston and Chicago. American suppliers of products such as steel for railcars must now compete against the resources of the Chinese government. These cases illustrate why enhanced CFIUS review is critical for limiting the negative impacts of FDI by Chinese firms in the United States. The author thanks Samantha Sanders for comments, and Zane Mokhiber for technical and research assistance. 1. References for data and statements of fact are included here in hyperlinks, and in Scott, Robert E. 2017. Growth in U.S.—China trade deficit between 2001 and 2015 cost 3.4 million jobs: Here’s how to rebalance trade and rebuild American manufacturing. Washington D.C.: Economic Policy Institute. 3. Bivens, Josh. 2013. Using standard models to benchmark the costs of globalization for American workers without a college degree. Economic Policy Institute briefing paper #354. 4. U.S. Department of the Treasury. 2017. Resource Center: The Committee on Foreign Investment in the United States (CFIUS). 5. The President’s Council of Advisors on Science and Technology (PCAST). 2017. Report to the President: Ensuring Long-Term U.S. Leadership in Semiconductors. Executive office of the President of the United States. 6. There may be potential synergies in this regard between research and policies designed to safeguard the bioeconomy. See testimony of Edward H. You, hearing of the U.S.-China Economic and Security Review Commission, March 16, 2017. 7. Kennedy, Scott. 2015. Made in China 2025. Center for Strategic and International Studies (CSIS). 8. Bradsher, Keith and Paul Mozur. 2017. China’s Plan to Build Its Own High-Tech Industries Worries Western Businesses. New York Times, March 17. 9. Sirkin, Hal, Justin Rose, Rahul Choraria. 2017. An innovation-led boost for US manufacturing. Boston Consulting Group report. 10. Reuters. 2016. US lawmakers seek to block Chinese aluminum bid: Zhongwang International’s US$2.3b bid for Aleris risks handing over sensitive research and technology, senators say. Asia times, November 3. 11. Brotherton-Bunch, Elizabeth. 2016. China is on a Buying Spree. Is the Chicago Stock Exchange Next?. Manufacture this (Alliance for American Manufacturing blog), December 19. 12. Representative Peter DeFazio, et al. 2016 Letter to Treasury Secretary Jacob Lew on pending transfer of Vertex Railcar Corporation to China Railroad Rolling Stock Corporation (CRRC) and Majestic Legend Holdings. July 15. [PDF].